If you are ever going to be in Memphis, I would highly recommend a visit to Graceland. I’m not a big fan of Elvis, but it was fascinating to tour his home. My favorite part was when we passed by the family graves. The tour guide lowered her voice as if we were going to wake him. She was giving reverence, like someone would give to a god. 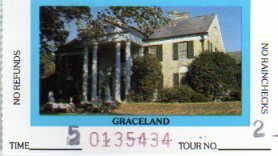 Hi Paul: Harvey and I went to Graceland many years ago. I was not a big Elvis fan either, but what really impressed me about it was that Elvis apparently kept every one of the handmade gifts that his fans sent to him – there’s a huge collection of them in his museum. I think he must have been a very sweet guy.